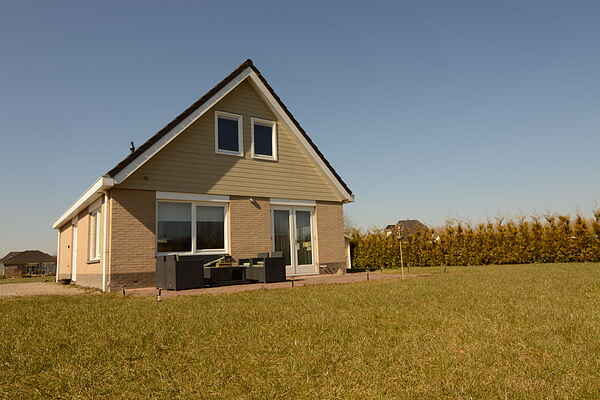 Very tastefully furnished holiday home in a luxurious setting in Zeewolde. This a house in a beautiful location with a large garden. The garden is very suitable for playing, but also for sunbathing or to have a barbecue during the summer. There also is a shared swimming pool with children's pool on the grounds, as well as a number of tennis courts. As a guest you can use these. Zeewolde is a nice town by the water and there are plenty of things to do during your stay. There's a beautiful marina and enough nice beaches. The beaches are perfect for families with children because of the shallow water. There are also plenty of nice terraces and restaurants. You can go to the Wolderwijd or Veluwemeer for water sports. You can also rent a boat or canoe in one of the marinas. The towns of Harderwijk, Ermelo and Almere are nice to visit. There are plenty of possibilities for golfing, biking or walking in the area. It is a fresh, luxurious home with free broadband internet access via wifi and the film networks: Film1 Premiere, Action, Family and Sport. Furthermore, the house is equipped with all facilities such as 2 bathrooms, dishwasher, washing machine and dryer, separate oven and microwave, separate fridge and freezer, lounge garden furniture with parasol, BBQ, children's playhouse, etc. The garden is closed by gates on both sides of the house, so children and \/ or pets can safely play in the backyard. The house is friendly for wheelchair users, a bathroom and bedroom on the ground floor, 93cm wide doors and a barrier-free ground floor. Furthermore, no specific adjustments have been made such as; different sanitary facilities; toilet brackets or the kitchen. Making the house great for a wide audience to use. For children there is plenty to do: There is a playhouse with slide and 2 swings in the backyard. There is a large swimming pool with children's pool on the park. In the vicinity there is plenty to do for children such as: Hansel and Gretel pancake restaurant with fairytale forest (this is really a special attraction and without entrance fee due), the Walibi amusement park, the Dolfinarium, the animal park in Amersfoort, Sichting Aap in Almere , or the Muiderslot can be visited. For sportive people there is also plenty to do (within walking distance): the park is located in the \"largest deciduous forest of Western Europe\" where you can run, cycle or hike. There are also 2 all-weather tennis courts (free of charge) at the park. Fishing is possible, which is located next to the park. This is a popular fishing spot. At the park it is possible to rent bicycles and canoes. Zeewolde has 6 beaches on the Randmeren, where play equipment and beach bars are present, there is also a dog beach for dog lovers. Zeewolde has a nice center with supermarkets, shops, restaurants and terraces in the port of call. The nearest town is Harderwijk (15 min by car) where good restaurants, cafes, nightlife, the Dolphinarium, Sauna complex Zwaluwhoeve and shops are present. Here is also the possibility to rent a boat and explore the Randmeren. Other cities in the vicinity are: Amersfoort, Nijkerk, Elburg and Almere. A popular outlet shopping mall is Bataviastad in Lelystad, where the Batavia Yard (here, ships from the Golden Age are reconstructed) is located next to and you could combine a visit. There is plenty to do in Flevoland and its surroundings. In the house is an information folder where all trips are described and information brochures are present, Zeewolde also has a tourist office.